Dry your dishes in style with this stylish metallic dish drainer from Present Time! 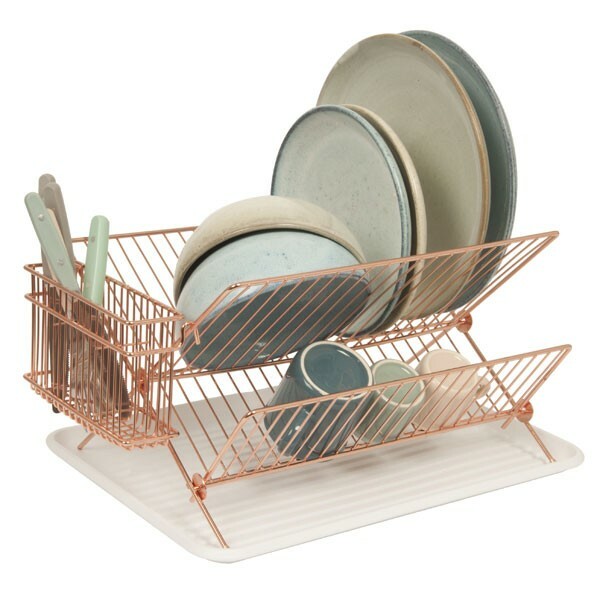 A stunning blend of form and functionality, the Copper Wire Dish Rack would make a delightful addition to any kitchen sink area. Complete with an upper rack for plates, a lower rack for mugs, a utensil holder and a plastic draining tray, this wonderful wire design is ideal for helping you dry up after a family meal or dinner party. It is also fully collapsible; allowing for easy storage when it is not in use! Copper is a hot trend at the moment, and this kitchen companion is a perfect way of getting on board with this super chic style. This sleek design is therefore ideal for modern, rustic and shabby chic style kitchens. Check out our other dish racks - and also a selection of copper home accessories - on the right hand side! Not quite as functional as I would have thought. I am very pleased with my item! Terrific product, high quality. Great service from ordering right through to delivery. Can't fault the service or the product. Like this but the cutlery bit moves about a bit depending on what you put in it - it looks great though!